Yelling is the new spanking. While many parents have taken physical punishment out of their discipline toolbox, many have replaced it with yelling. It’s not uncommon for a parent to resort to yelling when they are left with a empty toolbox and no idea how to disipline a child without the tactics that they were shown by their own parents. Discipline is not always easy, and so parents can come a little unhinged when they are faced with a discipline situation and don’t know what to do. When I realized what I was doing and how ineffective and damaging it was, I set out to stop yelling at my children. It may seem like an impossible task, but you can do it, too! Empathy is crucial when it comes to changing your yelling ways. If you currently yell at your children, you probably had a model for this behavior in one or both of your parents and several other adults in your life (teachers, coaches, relatives, etc). Remember how it felt when you were yelled at. If you were yelled at a lot, you may have wall up that prevents you from feeling much empathy toward your children. You may even think that they deserved to be yelled at (or worse), but you are wrong. You didn’t deserve it and neither do your children. Put yourself in their shoes and think about how it feels to be smaller than the person who is speaking to you in a harsh way. If your children are bigger than you, think about how ridiculous you look when you yell at them. 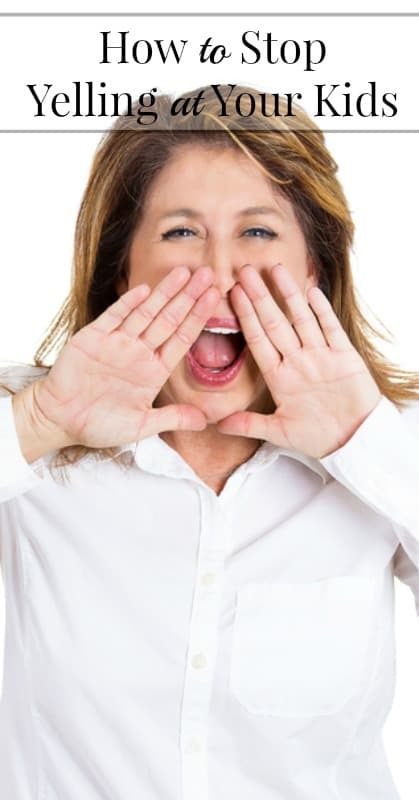 The first step to squashing your yelling habit is to be mindful. Watch yourself closely, but in a detached way. When your child misbehaves, notice how you feel. I bet you’ll find that your tendency to yell is a purely knee-jerk, emotional reaction. If you want to stop yelling at your kids, you have to first know your triggers and understand when you are more likely to yell. Maybe a discipline situation causes you to yell one day but not on a different day. What triggers a harsh response sometimes but not others? Likely culprits are stress, illness, hunger, tiredness, hormonal issues or mental health struggles. Once you are mindful of your triggers you can work on your response to situations in which you usually yell. There is a good chance that if you grew up in a household where physical punishment was acceptable, you were spanked when your parents had an emotional reaction to something you did. What surprised me most about dealing with my children’s misbehavior in the preschool years was not how difficult they were (they were actually pretty normal — and barring any medical or mental conditions, so are your children.) but instead how emotionally reactive I was to their misbehavior. While my first impulse was never to use physical punishment, I would often to raise my voice to show just how serious I was. If you take the emotion out of the situation and focus on solutions, the yelling is automatically extinguished. For example, if your child breaks a window, instead of becoming emotional while you think about the expense and repair time that it will take to fix it, focus on the fact that there is a solution to the problem. Calmly explain your child’s responsibility in the solution — whether he or she will not receive an allowance until the window is paid for or if she or he will not be allowed to play ball in that area of the yard or whatever other logical consequence you may choose. Your job as a parent is to discipline (read: teach) your child and not to heap on punishment to make them feel pain. Keeping your emotional reactivity to a minimum requires you to be emotionally mature, but will set a wonderful example for your children of how to handle difficult situations without dissolving to irrational behaviors and words. Until you are able to master the last tip, try telling your children how you feel when they misbehave. You are responsible for your own feelings, so you have to word them in a way that doesn’t put blame on your child but instead shows them how their actions can affect others. For example, if your children fight with one another and won’t stop when asked nicely, let them know that when they fight you feel frustrated or annoyed. Do not say, “You make me frustrated when you fight!” Instead say, “I feel frustrated when you fight!” Take responsibility for your emotions, but explain to them how you feel. Did you know that when your child is engaging in non-dangerous misbehavior you don’t have to deal with it immediately. Let’s say your child is refusing to clean his room. If you are angered to the point of yelling at him, it’s okay to walk away. Let him know that you are angry and need a minute to cool off before continuing the discussion. In this particular scenario, I have come back to find my son’s room cleaned. The seriousness in my voice–even at a low, quiet tone–was enough to let him know I meant business. Other times I have been able to come back to the situation and explain why the task must be done or the behavior must be stopped and because I was non-emotional about it, my child was not defensive and was able to fully cooperate. I told my children when they were very young that it is not okay for mommy to yell at them. I asked them to tell me to stop if I yelled at them. This teaches them that parents can make mistakes and that, mostly importantly, that they do not have to accept people behaving in a rude or abusive manner toward them. Now, it wasn’t often that my children would actually tell me to stop — a yelling parent is an intimidating parent–but every once in a while they’d meekly remind me that I wasn’t suppose to yell. Even now my oldest will ask me to calm down and will offer a hug if I’m teetering on the verge of raising my voice toward one of his brothers. I appreciate his bold protectiveness of his brothers and his way of showing us all that a kind word can turn away wrath. Ask your partner to stop you if you yell at your children. This doesn’t mean that he or she has to go against what you’re trying to tell your children, but instead he or she is helping to relieve a tense situation by being a calming factor. If your partner can better explain to your child what needs to be done (or not done) in a calm manner, then your child will get more from your partner in that moment than he or she will from you. If you’ve taken physical punishment out of your discipline toolbox and plan to removing yelling, as well, it is crucial that you have other methods of getting through to your children. Here are a few of the things I’ve used over the years to replace harsh parenting practices. When my boys were little I found that I was too often yelling over them when they squabbled. I looked crazy and they learned nothing, because raising my voice made me feel as crazy as I looked. I bought a whistle and used it to get their attention instead. When I can’t get a word in edgewise with a whiny, complaining or argumentative child, I simply raise my hand and don’t speak until they are finished. Then I ask that they do the same while I say what I need to say. The conversation stays civil instead of ramping up in intensity. This is similar to raising your hand, only here you aren’t waiting to speak. You are done speaking. This is useful when your child is talking back or continue to beg you for something you’ve already said no to. When they realize you aren’t going to continue to negotiate or argue with them, they will likely stomp away or hurl a lovely, “I hate you!” your way. Let it go, mama! Let it go. While playful parenting is not my default style, it is very useful at diffusing intense situations. If you feel like yelling, “You guys are driving me crazy!” change your accent and give them a your dramatic British version of the same sentence. Also, singing your requests can help. When it’s time to clean up or get ready to go, turn it into a silly song that prompts your children to move faster just to get you to stop. One caveat on this one, though — if your child has become truly annoyed with your silliness, don’t keep heaping it on. This only teaches them to be the bully who says to others, “What? I was only kidding! You’re too sensitive!”. Nobody likes that person. When your kids won’t listen, start writing! Request that their complaints, demands and rebuttals all be submitted in writing. Remember when you first begin trying to stop yelling at your children, you will fail. You will probably fail daily. That’s why it’s important to take it one hour at a time. Congratulate yourself for every hour you get through without yelling at your children. Take the beginning of each new hour as a fresh start. What are your tried and true tips for how to stop yelling at your kids?